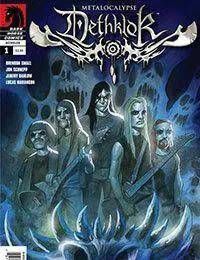 Based on Adult Swims hit animated series Metalocalypse, Dark Horse presents its first Dethklok series, after the one-shot crossover with the Goon. Nathan, Pickles, Murderface, Toki, and Skwisgaar are back; rocking out as their fans die! And no one can forget Dr. Rockso, still doing ka-ka-ka-cocaine, ba-baby!